Animisms : suite for five instruments / Ross Edwards. Instrumentation: Flute/piccolo, clarinet in B flat, percussion, violin, cello. This little suite was composed - and in some cases re-composed - in the spirit of "light but not trite" in response to a commission from the Australia Ensemble. It is dedicated jointly to Sir Peter Maxwell Davies, who celebrated his 80th birthday in September 2014, and to the Australia Ensemble. I. Bubbles -- II. Serenade -- III. Crow dance -- IV. Fox vigil -- V. Madagascan song. This edition produced Jan 18. 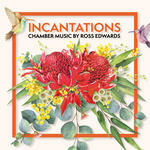 CD: Incantations / chamber music by Ross Edwards. Score: Animisms : suite for five instruments / Ross Edwards. 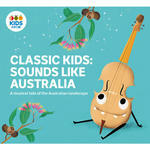 CD: Classic Kids: Sounds Like Australia : A musical tale of the Australian landscape / Luke Carroll, Ensemble Offspring.